Financial instability and debt resulting in marital problems, loss of security clearance or even suicide degrade mission readiness. If you need help, now is the time. Make a commitment and participate in Military Saves Week, which runs Feb. 26-March 3, 2018. Military Saves Week is an annual program held at Army installations across the world. Military Saves urges you to pledge to recommit to saving. GRAFENWOEHR, Germany — Financial instability and debt resulting in marital problems, loss of security clearance or even suicide degrade mission readiness. “Soldiers’ top priority is to maintain their deployability,” said Command Sgt. Maj Mike Sutterfield, U.S. Army Garrison Bavaria’s command sergeant major. Being ready to go to the fight is a Soldier’s top priority. But Soldiers can lose or be denied their security clearance, risk not being promoted and possibly end their careers or lives over finances. Soldiers and their families stuck in debt or mired in financial problems are not alone. Help is available. Soldiers and Army civilians in debt are more susceptible to bribes in exchange for secrets. National security can be compromised, which is why a person’s finances are analyzed as part of the background security checks. “According to the Department of Defense Consolidated Adjudications Facility, financial issues are one of the leading causes for denial or revocation of eligibility of a security clearance,” said Gail Holt, USAG Bavaria’s security manager. Financial instability and mistrust among loved ones can also negatively impact Soldiers’ readiness. The loss or denial of a clearance, for example, could prevent continued employment or promotions. Plus, financial problems can account for as much as 36 percent of divorces in the U.S., according to a University of Denver study. Evidence also suggests that financial instability is connected to military suicides. According to the DOD Annual Report of Suicides, financial difficulty was one of six stressors present in 66 percent of suicides and 75 percent of suicide attempts — the majority committed by individuals aged 20-24. In an effort to promote healthy habits, the Department of Defense partnered with a number of agencies — including the Federal Trade Commission and Consumer Financial Protection Bureau — to create Militaryconsumer.gov to offer free education to military service members. 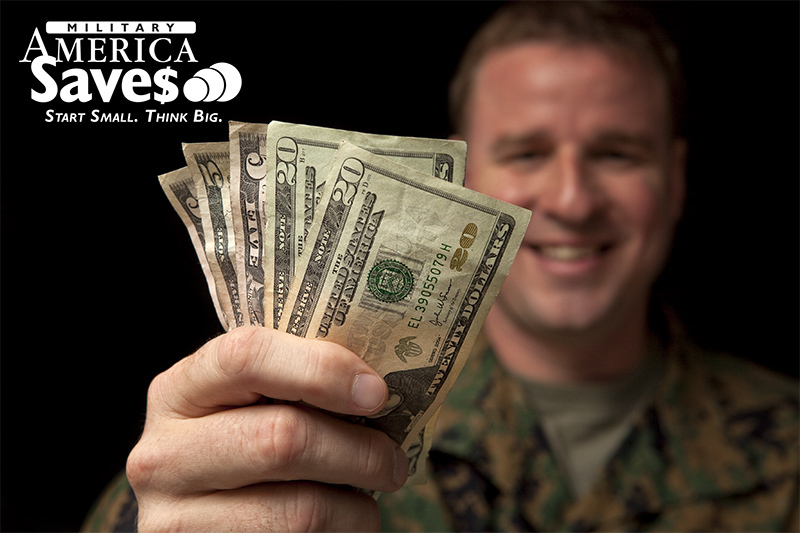 The site aims to empower DOD personnel to make better-informed decisions when managing money. The garrison can also help. Army Community Service’s Financial Readiness Program offers financial counselors throughout the year who provide assistance in military pay, checking account management, credit reporting, debt elimination, saving, investing and budgeting. Other programs within ACS also assist those who have more immediate needs by getting service members pre-screened for Family Subsistence Supplemental Allowance and Army Emergency Relief. If you need help, now is the time. Make a commitment and participate in Military Saves Week, which runs Feb. 26-March 3, 2018. Military Saves Week is an annual program held at Army installations across the world. Military Saves urges you to pledge to recommit to saving. Take the pledge and earn a chance to add $500 toward paying off your debt. The week is filled with events and offerings promoting good savings behavior and a chance for service members and their families to assess their own saving status. During Military Saves Week, the USAG Bavaria Financial Readiness Program, in conjunction with other services on-post, highlight how to save, reduce debt and build wealth. Participating organizations will be present at information tables located at the Rose Barracks and Tower Barracks Exchanges, USO, Bldg. 150, the lobby of Bldg. 244 and the Camp Aachen MWR Recreation Center, Bldg. 2440. ACS offers free personal finance classes daily that week from noon until 1 p.m. Locations for the classes are Tower Barracks, Bldg. 150 and Rose Barracks, Bldg. 322. For more information on how the garrison can help you, or for the latest on Military Saves Week, call DSN 476-2650, CIV 09662-83-2650.